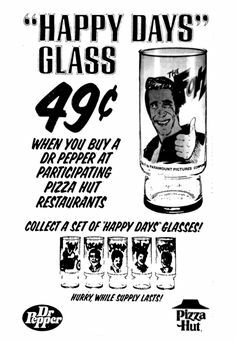 In 1977, Pizza Hut and Dr. Pepper teamed up to offer premium drink glasses to customers featuring the stars of Happy Days, which of course we discussed in this episode of the podcast. Ralph Malph looks kind of menacing here. Or maybe he looks like David Letterman. Or maybe both. "Duhhhh....gee, Fonz, whaddya wanna do today? I reckon we could go on over to Al's and throw rocks at them fancy college kids." 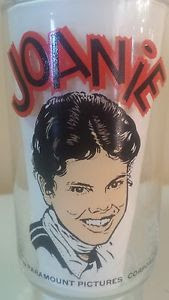 It's like someone took Opie Taylor to a secret underground lab in the Ozarks, conducted experiments on him for years, then released him by driving a van into Milwaukee, shoving him out the back, and speeding away. Enjoy National Pizza Day, everyone! 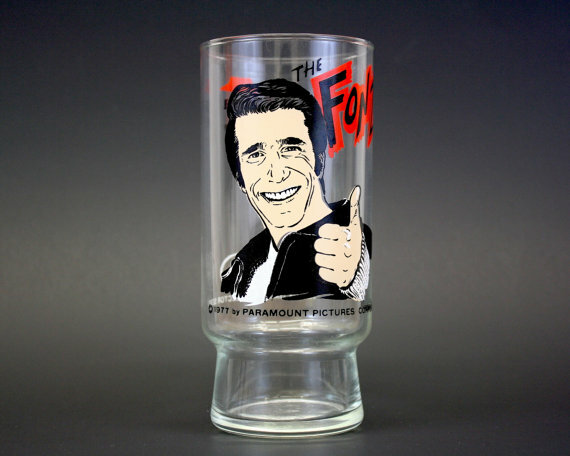 Thanks to the collectors on the Internet who posted pics of these swank glasses. Special credit to anyone who was actually able to ingest food in 1977 while staring at that Richie glass. Where were you 35 years ago today?